The Oxtar Matrix was a favorite of sport-tourers. Due to a trademark issue, the boots have been reborn as the TCX X-Five. The protective, breathable, waterproof Goretex-y goodness is now on sale at NewEnough for $215.99. Great price; awesome boots. Check 'em out here. 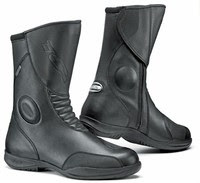 As a service to my fellow motorcyclists, I sometimes post information on sales and closeouts on quality motorcycle gear. I get this information via subscriptions to email notices and newsfeeds of some of my favorite vendors, and I also stumble across this information during my daily travels on various online forums, etc. Unless otherwise noted, I haven't used or tested this gear; I am simply giving a "hey, lookee here!" on what appears to me to be a good deal on quality stuff from a good vendor. Be an informed consumer and research before buying.